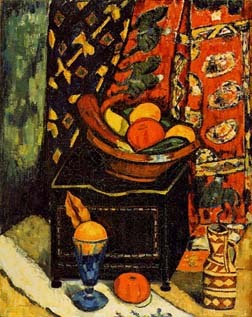 Marsden Hartley's two still lifes, split between Galleries C and D, offer an example of the disservice shown to many of the exhibitors, both European and American. Montjoie, a short-lived magazine that Malcolm Gee called "a propaganda sheet for the entire Cubist movement," criticized the Armory Show organizers for splitting Marie Laurencin's paintings between several galleries, which limited the impact of her work (Gee 113). Since many American artists who participated in the Armory Show were only represented by two paintings, the effect of their work was strikingly distilled. Hartley's Still Life, No. 1 (above left) was not reflective of his latest efforts but does display a flattened perspective of traditional still-life subjects, fruits and vegetables, pared with the artist's own found objects, the Navajo jug and tapestries. Hartley's color studies, shown in Gallery L, undoubtedly demonstrated his exploration of cubism and expressionism during his time in France and Germany. According to Barbara Haskell, these six drawings in the 1913 exhibition, "known only through the thumbnail sketches that Carl Zigrosser made at the time of the Armory Show, represent Hartley's first exploration of his new idiom" (Haskell 28). Hartley's work in the years 1913-1914 reflects his adaptation of Kandinsky's theories found in On the Spiritual in Art, as well as an integration of Native American icons.